A slew of DVDs have been released by PBS Distribution. We may he been a little late in bringing you the news, but trust us: These releases are must-see, must-own treats! Enjoy a special night of music from the composer of Mary Poppins a other beloved Disney gems. Richard M. Sherman: Songs of a Lifetime features a landmark solo performance by the legendary Disney composer, whom with his brother Robert, composed some of the most beloved songs of all time, including music for Mary Poppins and The Jungle Book. Oscar-nominated filmmaker Don Hahn brings this once-in-a-lifetime concert to the screen, filmed entirely at historic EastWest Studio in Hollywood where Frank Sinatra, Elvis Presley, and the Beach Boys famously recorded their albums. A brilliant cast of performers joins Richard, including the star of Broadway’s Mary Poppins Ashley Brown, as well as Juliana Hansen, Wesley Alfvin, and The Dapper Dans of Disneyland. Rare: Creatures of the Photo Ark is a captivating three-part series that follows renowned National Geographic photographer Joel Sartore as he documents threatened species at zoos, in nature preserves, and in the wild. Throughout the program scientists and naturalists reveal surprising and important information about why ensuring the future of these animals is so critical. When complete, the Photo Ark will be one of the most comprehensive records of the world’s biodiversity. Through the film, audiences can journey with Sartore across the globe—to Africa, Asia, Europe, North America, and Oceania—to chronicle his experiences. Frontline: Life on Parole is a insightful documentary that explores how Connecticut is rethinking its parole program. More than two years in the making, the program is a remarkable, firsthand look at why some people stay out of jail, why some go back, and how one state is trying to break the cycle of recidivism. About half of all inmates put on parole in the U.S. end up violating the terms of their release and are sent back to prison. Parole is a condition that offers a taste of freedom but comes with strict prohibitions on whom you can live with, where you can go, what time you have to be home, and more. But across the country, states are trying to change the way their parole systems work in an effort to lower recidivism rates and reduce prison populations. With unique access inside Connecticut’s corrections system, as well as camera-phone footage filmed by the parolees themselves, the film follows four former prisoners as they navigate the challenges of more than a year on parole—from finding work, to staying sober, to parenting—and doing it all while under intense supervision from the state. Welcome to the release of The Durrells in Corfu Season 2. Inspired by the beloved memoirs of Gerald Durrell, The Durrells in Corfu features Keeley Hawes as Louisa Durrell, the harried widowed mother of a brood of recalcitrant children (this season ages 12 to 22). Louisa moves the floundering family from England to Corfu in the mid 1930s to recharge their lives—hers included. The new season finds the family in dire financial straits, as usual. They have a new landlady, Vasilia, an island beauty who holds a mysterious grudge against Louisa and insists on prompt payment of the rent. And then . . . think we’re giving it all away? Tune in! Allow us to steer you to the best chronicle of Chevrolet cars throughout two decades of speed and style. 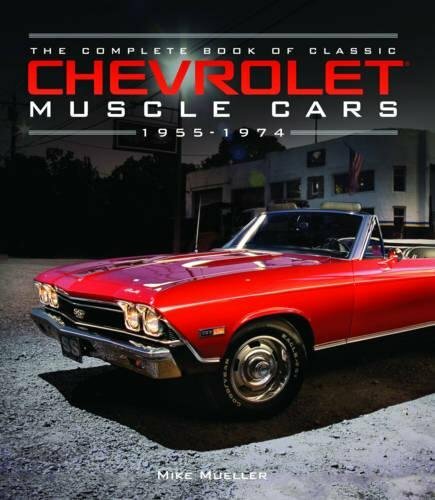 Park Mike Mueller’s The Complete Book of Classic Chevrolet Muscle Cars: 1955-1974 (Motorbooks/Quarto Publishing Group, $40) in your essential library after you’ve taken it for a few fascinating laps o’ reading. Chevrolet didn’t invent the overhead-valve pushrod V-8 engine, but without question Ed Cole and company perfected it. And General Motors’ Bowtie division wasn’t the first to put the engine design in a production car, but it was the first to put the engine design in an affordable production car and make it available to the average driver. No other automobile in history so clearly demarcates a before-and-after line in the sand like the 1955 Chevrolet. This was the birth of the affordable performance car, and from the moment the car hit the streets, the experience of driving would never be the same. The impact that an affordable American sedan with a powerful performance engine had on American society was so great that it not only changed the experience of driving; it changed the psychology of a generation. Prior to the introduction of the 1955 Chevrolet with its V-8 engine, cars had been considered necessary appliances, like refrigerators or vacuum cleaners. With a single stroke, Chevrolet turned American culture into a car culture. Chevrolet dominated the muscle-car scene throughout the classic era. The Impala SS, with its 409 engine popularized by the Beach Boys, ruled America’s drag strips. The Z16 Chevelle Malibu SS396 became the every man’s muscle car. The Camaro turned the pony car genre into genuine muscle cars. The LS6 engine was the most powerful of the classic era. The book’s luscious 183 color and 37 black-and-white photos will have you revving the engine!